Based on daily interviews of approximately 350 U.S. adults, with more than 122,500 annually, the report illustrates the extent to which education consumers in the U.S. are pursuing and completing postsecondary education programs that advance their chosen careers and life goals. This report -- the first of a three-year series that will explore individuals' perceptions of their education paths -- provides initial insights and sets a foundation to help students most effectively and efficiently achieve their economic and personal goals. 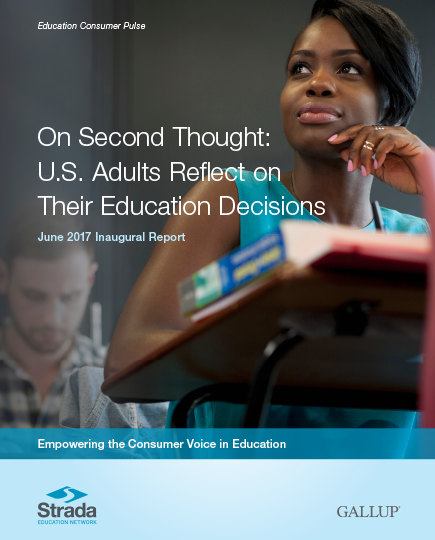 This first look focuses on three key questions asked of U.S. adults who previously enrolled in or completed postsecondary education or training. Would U.S. adults pursue the same level of education? Would U.S. adults pursue the same area of study? Would U.S. adults attend the same institution? These insights will provide a better understanding of the critical decisions and nuances that shape the many complex issues facing postsecondary education today.